Google Lens is a handy little tool. Announced at Google I/O 2017, Lens is essentially a visual search engine. Take a picture with your phone, and Google will do some clever analysis and provide insights into what you’re looking at. Now, it’s getting even better, and can store information from business cards as contacts, and even describe landmarks you’ve spotted. If you’ve got a business card, just open a photo of it in Google Photos and navigate to Lens. With just a tap, Lens will automatically create a contact for you using the information printed on the card. This is handy because it addresses the two things I really hate about business cards. Firstly, people at conferences eventually run out of them, meaning you’ve got to write their contact details down on a slip of easily-losable paper. I always lose them. Always. Secondly, it means you don’t actually have to take the card, because you’ve already got the information stored electronically. This is music to my ears. An unavoidable hazard of this job is that my apartment is littered with literally hundreds of business cards, which almost always show up in the most unexpected of places. You could describe business cards as the glitter of the working world. If you’ve never used Google Lens before, and are worried about it being laggy or slow: don’t be. It’s blazingly fast. I tested this feature out on a mid-range Honor phone using cellular data. It took about five seconds from start to finish. Look, Lens will get back to you, okay? It doesn’t work miracles. In addition to identifying buildings, Lens also gives you information you might need. This includes things like a description of the place, or its opening hours, thereby saving you a Google search. 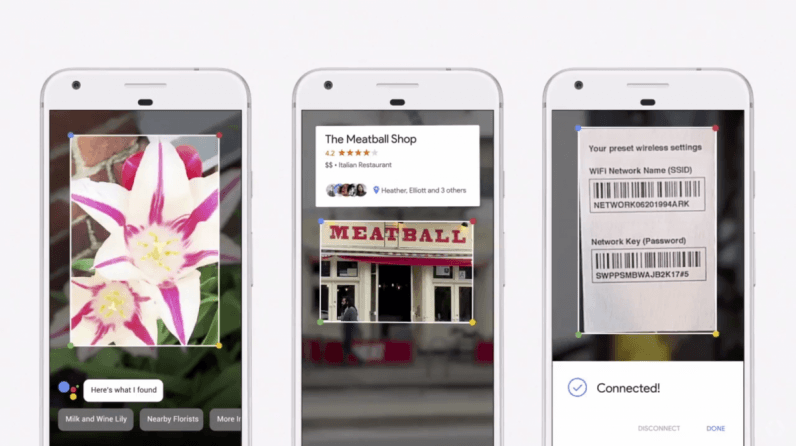 The latest and greatest version of Google Lens is found in Google Photos. If you don’t have it, you can download it here. If you have the app installed (which you probably will, as Google Photos comes pre-installed on most Android devices nowadays), but can’t find the feature, you might need to update it. And I won’t make a joke about Windows phone because I did that yesterday. TNW 2018 is coming soon, and we want to see you there. Read all about our conference and how you can attend here.